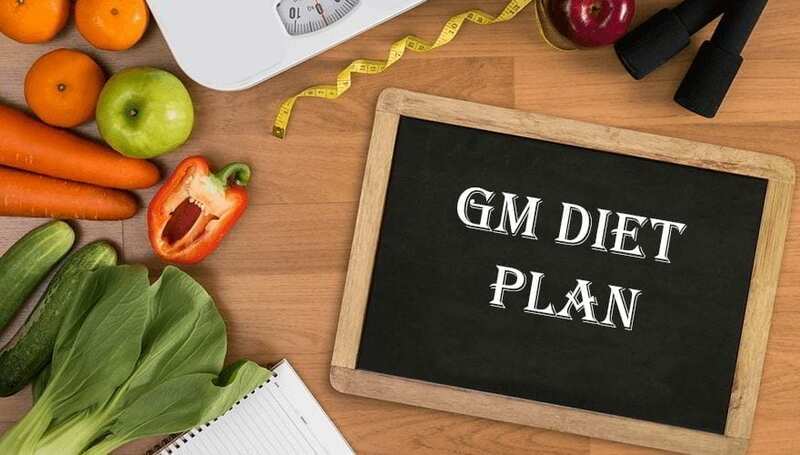 All You Need To Know About the General Motors(GM) Diet Plan! Losing weight has become almost every person’s common desire these days. Healthy weight loss gives you a pleasure of slim look and better working potentials as well. More than all, it is a mandatory need to be fit. How can one lose weight naturally as much they wanted so quickly without facing any side-effects? There are plenty of weight loss diet plans available over the diet books and internet. GM diet plan is first on that list. Losing Weight is Not Everything, But it Matters! With heavyweight, there is no risk to life as such. Everyone who is weighing more than they should need not be in an ill-healthy condition. But, when you are supposed to have no bad cholesterol in your body, there is absolute need to shed your sweat to get better. Among many great diets for weight loss, GM diet is master of all. When you search for the most effective method to lose weight naturally, GM diet gives you a potential way to become slim at no cost of your health. Here you can find the fastest way to lose weight through this article, and the diet has very natural & organic suggestions which give you the fruitful result of weight loss in 7 days, just. How Does this Work? Scientifically..
Why is this Diet so Special? GM Diet plan is started in around 30 years ago by General Motors Company. They had started this 7 days diet plan to lose weight for their employees in order to increase their productivity at the job and keep them healthy. They were expected to become more energized, confident. They had the association of Food and Drug Administration, United States Department of Agriculture. The results came out to be remarkable. From that point, the gm diet chart has become hugely popular. People all over the world had adopted them as gm diet plan doesn’t involve any rare ingredients to find/buy. Moreover, this diet is easy to follow for anybody except diabetic patients and pregnant women. Special cautions are mentioned in the article down. One should maintain strict timings on this diet for the seven days throughout. Because, this is a diet which focuses on a healthy weight loss and if any item or drink is delayed to be taken or misplaced, the results might be completely going undesirable. These are the food timings which are to be followed seriously. Breakfast: You should have your breakfast each day before 8.30 AM, not later than that. GM diet chart is so designed that there should not be any hunger problems. This we could see in the diet timings also. By taking small amounts of great nutrients timely within 2-3 hours gap in between, there is a huge possibility of losing weight and being healthy too.For all these reasons, this GM Diet plan is the best weight loss diet for everybody out there in the need. Let us get into the schedule of the diet. 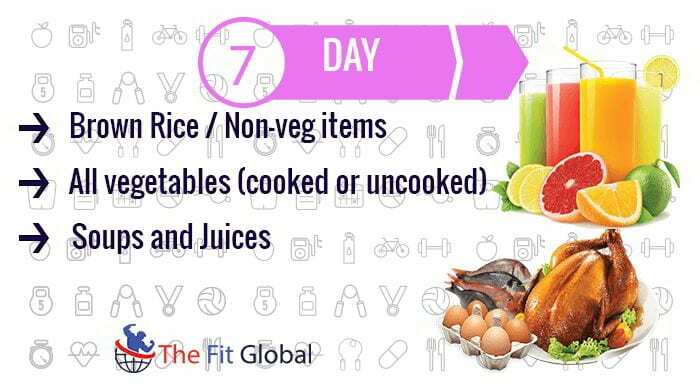 We have 7 days time and each day is given a special food pattern so that the fat burning foods and nutrients are perfectly supplied to the body. Don’t panic that you’re going to follow a strict or harder life through the coming week. It’s as easy as eating fruits, but an entire week. This won’t suffer you much as you think. On the first day, fruits take the major part in the diet. Or the fruits to eat, there’s no time restriction. Water should not be taken less than 8-12 glasses. Eat as many fruits as you continue to be hunger, don’t starve of hunger at any time. Watermelons and cantaloupes are mainly recommended as they are rich in fiber. Also, oranges, apples, and papayas contain fiber in good amounts. Hence, they are the other fruits suggested. Do not consume bananas for the entire day. It is observed that you can lose up to 1-½ kgs by the end of the first day. Note the schedule down for the healthy pattern. Breakfast: Some apples with water. Mid-Morning Snack: Cantaloupes with water. Afternoon Snack: Orange and Water. Evening Snack: Apples are allowed. Dinner: Cantaloupes, guavas with water. As you have successfully completed the day 1, you are ahead to face the second challenge. This is an important step of the gm diet plan. This is again a vegetarian day. Vegetables can be cooked or could be taken raw. Oil is strictly not allowed for cooking. Cut the oil completely out of food. This means you cannot have deep fried dishes and chips. Like the first day, you can eat all the time whenever you are hungry. Butter or olive oil are allowed moderately only if it is essential. Breakfast: Boiled potatoes. The Little amount of butter for flavoring. Mid-Morning Snack: Cabbage and lettuce salad or some vegetable juice or fruit juice. Lunch: A mixed vegetable salad with cucumbers, onions, and carrots. Afternoon Snack: A cup of boiled broccoli, half a cup of sliced bell pepper. Evening Snack: Some boiled cauliflower. Dinner: A salad with boiled carrots, broccoli, and green beans. 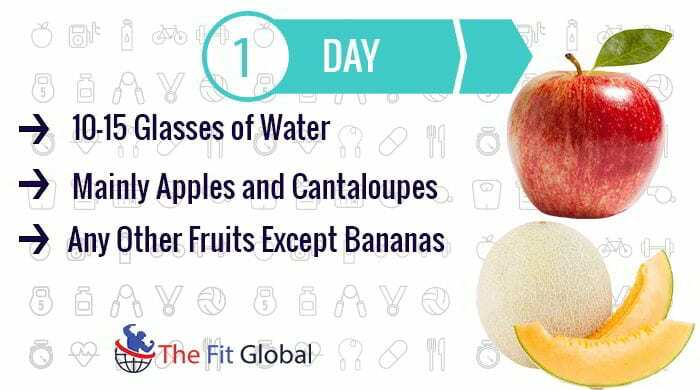 This day again involves fruits and now the combinations of fruits and vegetables become more beneficiary as protein is given by vegetables and fiber content is improved by fruits without any fat. Fruits are vastly allowed this day same as the first day, but you should complete the day by having vegetables. We have given you some recipes suitable for this diet which will bring you some new energy and difference from the routine diet. A soup could be taken on this day. Do not take bananas this day also. Mid-Morning Snack: Pineapple as much you can eat or a pear. Lunch: A salad of cucumber, carrots, and lettuce salad. Afternoon Snack: An orange with a cantaloupe. Dinner: Boiled broccoli and beets. 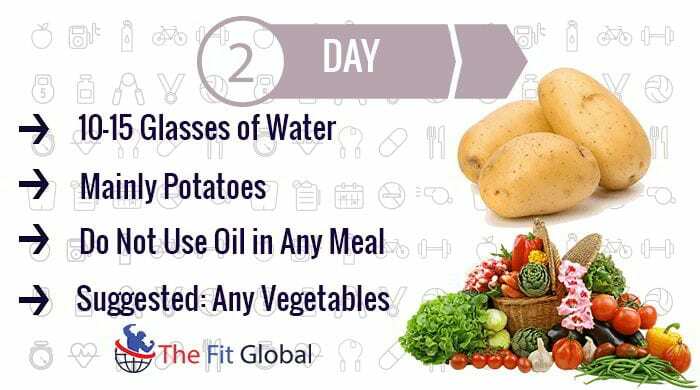 By the end of Day 3—You can now eat any other harder ingredient that is suggested as you are done with only fruits and vegetables throughout the first three days. 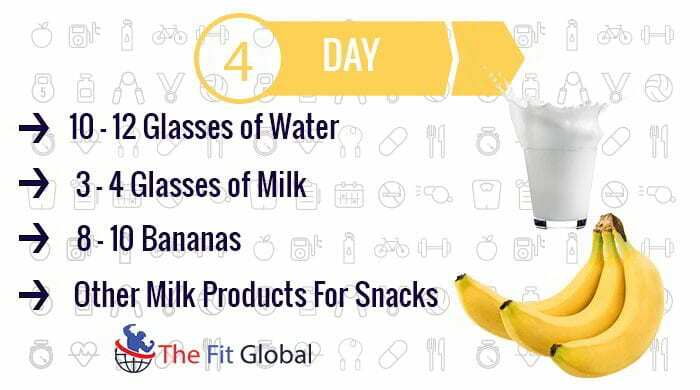 4th day’s diet is completely dependent on bananas and milk. During the meals and snacks time, you are suggested to take bananas. You can take milk almost every alternate session, if you are unable to take so many times, you can take the diet soup also. As always water has a big role to do to your health, so don’t neglect to take a minimum of 8-12 glasses of water. Breakfast: Bananas and a glass of milk. Mid-Morning Snack: A banana shake. Honey is no danger if added. Lunch: A bowl of GM diet soup. Dinner: Bananas and a glass of milk. As a part of gm diet plan, we have given more weight to vegetarian items. A couple of non-vegetarian items are mentioned, though, we are going to describe some extra recipes in the non-veg category also. On this day, you can relieve a bit as you are going to have some easy food, brown rice/Chicken. But however, oil should be of minimized quantity for cooking. Water intake should also be increased to around 13-15 glasses. A chicken soup and a tomato soup are also of no harm. You can take eggs and tomatoes in any three sessions. Breakfast: A few small tomatoes with a bowl of boiled seasoned kidney beans. Mid-Morning Snack: A cup of yogurt. Lunch: A bowl of cooked brown rice/chicken breast/fish with two tomatoes. Afternoon Snack: A salad with onions, and sprouts. Evening Snack: An apple and a pear. The sixth day also involves high-calorie food, this day is all similar to the previous one, but adds vegetables to the table. As mentioned, vegetables should not be fried and should not be dressed in extra masala etc. By the end of the sixth day, you can observe weight loss visibly as you have followed the pattern carefully. This lost weight gives you encouragement to finish the diet off with a better mood, to maintain a good diet in future. Avoid heavy dressings for salads. Avoid tomatoes and potatoes on this day. No fried recipes are to be taken, only to be boiled. A Well-boiled skinless chicken can be included as a recipe for non-vegetarians. Non-vegetarians can eat eggs/chicken in any two sessions after breakfast. GM diet soup can also be consumed in consecutive sessions. Breakfast: A bowl of mixed boiled vegetables. Mid-Morning Snack: A bowl of boiled kidney beans with a diced tomato seasoned with spices. Lunch: A bowl of Brown Rice/Chicken Breast/Fish with the GM diet soup. Evening Snack: GM diet soup. Dinner: Boiled vegetables in a limited amount i.e., a bowl. And now, you are almost done! Came to the final day of most popular weight loss diet, with all success and door-stepping result. Now, you have almost a perfect answer to the question “how to lose weight in a week” as you have successfully accomplished the task of 6 days’ of travel without your own luxurious diet choice. On the last day, you can have a cup of brown rice with as many vegetables as you want. Fruits juices without sugar are allowed at every session along with the meals/soups. You can take cabbage or broccoli in place of brown rice. Mainly in the morning, it is advised to take fruit juice(preferably orange). Breakfast: A mixed vegetable salad in a small bowl. Mid-Morning Snack: GM diet soup with carrots. Lunch: A cup of brown rice, a bowl of boiled vegetables. Afternoon Snack: A few carrots. Evening snack: A mixed vegetable salad. Dinner: A bowl of GM diet soup. It is not mandatory to use the same items as mentioned above, they are the best choices when followed, but not a compulsory choice. Let us know more about the diet chart’s features and specialties and also how to lose weight fast in detail. Though there are many a number of good diets for quick weight loss, GM Diet Plan is the most efficient in showing the results because of its unique food suggestions and diet pattern. The diet is much reputed one among the other diet plans. Though people show a lot of flaws that it could not be carried out that it has such harder meal plans but if at all one tries this successfully, they do never have to look back to their weight loss problem. Here, find out the merits of the best diet plan for weight loss, gm diet. GM diet plan is of only 7 days’ duration, which is much quicker and efficient. You can lose up to 5 Kgs of weight within a week if you follow the diet carefully. As the diet follows mainly fat burning foods, simultaneously causing more intake of the fiber content. Very often, Gm diet is mentioned as the fastest way to lose weight. Not just the fast weight loss, the unique eating style of gm diet provides effective detoxification for the body. You can also feel your lightened body after a couple of days in the diet, which also makes you feel healthier mentally. A Large part of gm diet includes fruits and vegetables in which oil is almost banned and fiber intake is increased. Fiber improves one’s digestion, which in turn activates the fat stores in the body to melt. This is what the technical reason for weight loss/fat loss in 7 days. Once you are habituated to the gm diet chart, you can follow any kind of diet for health in future. Hence, this weight loss diet is severely impacting though it doesn’t seem to be. With its fat-killing ingredients, one could not gain any weight with gm diet when we maintain the strict regularity. 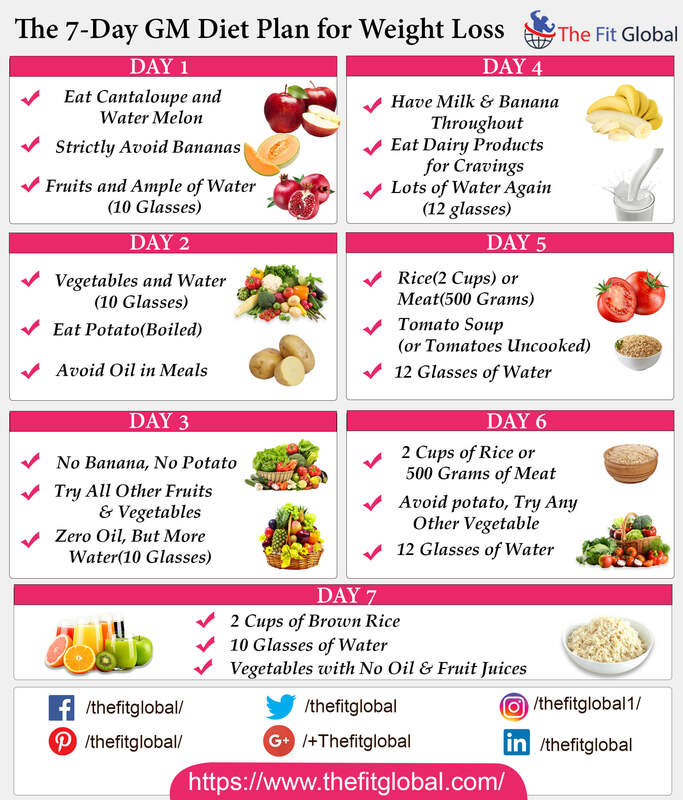 Non-vegetarians need not worry if they want to follow the gm diet plan because the incredible plan of weight loss in 7 days also includes the non-vegetarian food, but only after you complete the first 4 days successfully. 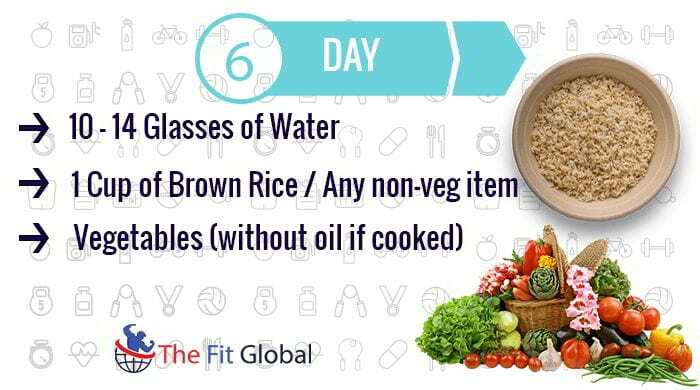 The diet has the recipes and weight loss meals for non-vegetarians After the fourth day, you can all replace the brown rice mentioned for vegans by non-veg items which are encrypted below. The foods suggested in the diet are highly fat burning. The food taken can melt the cellulite in the body cells and veins as they do not contain much fat in them. The food is rich in fiber, highly energizing, also fat killing at the same time. As it is already mentioned, this diet plan for weight loss does so much help to our body in regard to fitness and supplying healthy nutrients by removing fat from almost every part of the body. 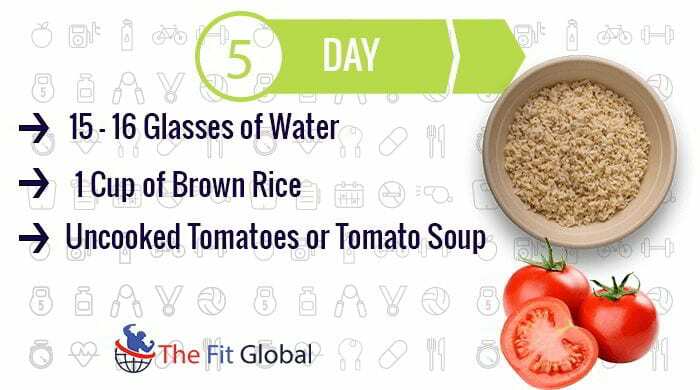 Gm diet plan lets you lose a weight of 3-5 Kgs within a week’s time. This is the quickest time period to lose such weight in a healthy way. It makes you feel energized, enthusiastic as you are less contented with fat and unwanted calories which make us feel lighter. You will be able to follow any diet once you get along with the gm diet. It looks harder to find a vegetarian diet chart for weight loss in 7 days but once after you go through this article, your opinion may look contrary to yourself in few minutes. You are not allowed to take high-calorie food in the gm diet plan. 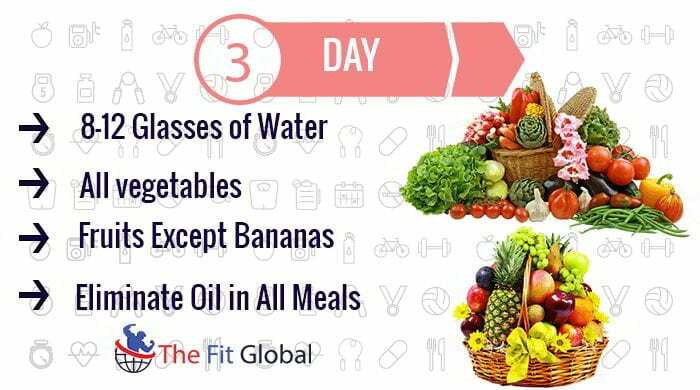 At the same time, you are only allowed to take fruits, vegetables for the first 3 days, with which you are going to lose nothing. But with an excess of which, unwanted weight gain may be inevitable. Fruits and vegetables are taken in wide amount, this makes our body get enriched with carbohydrates, fiber. As many vegetables, you eat per day, so many are the vitamins and nutrients you gain. Healthy digestion is possible with the diet followed. Brown rice is given after first few days in the diet, which is rich in carbohydrates and is with less fat. This is the best of all weight loss meals which are available in the form of other dishes as it contains raw organic ingredients with it. Proteins available in chicken are more energizing and contain lesser fat. In turn, proteins burn the fat stores in your body and improve metabolism. Why is Gm Diet So Special? This diet chart for weight loss is so special that we have already discussed its specialties in every section and we could not mention them in a separate one. Every element of gm diet plan is newer and it has its own unique features. Let’s see a couple of remaining things to be mentioned. This diet is so special one for foodies. The gm diet doesn’t limit you from eating how much you ever want to eat, but it has a huge impact on what you eat and what you strictly should not eat. You practice to eat small amounts more frequently (6 times a day) and take water at each session without fail, this makes your body free from toxins and leads to remove fat. Never ever try any diet plan on your own. Consult your dietitian before following a diet program, who recommends the best suitable food style for your body. If you are below 18 years old, you need not try any diet pattern how much effective it might be. Because children and teenagers should be encouraged to eat whatever they want to eat, but not restricted. If you are diabetic, please do not follow this. GM diet chart doesn’t fulfill all the nutritional requirements that they need. Pregnant ladies are also excluded from this diet plan as they need enough food nutrients to be fed to their children. Do not assume the thought that the weight loss in this program is a permanent result. You may regain the weight once after you finished the diet if you don’t go on a regular diet and good exercise to maintain the low weight. This diet is healthy as long as you could take it and weight is reduced. But after seven days, you should not be anymore on this particular diet. Take some fiber-rich and fat burning foods to avoid the threat of regaining the old weight. Strictly avoid alcohol during this weight loss diet. Alcohol is a huge calorie provider, which is a great contrast to our diet plan to lose weight. Too much alcohol consumption may lead to low blood sugar which consequently may cause drowsiness and fainting. Other diets are also included in gm diet plan, which helps in a little bit deviation from the monotony of having regular intakes. There is a famous soup recipe named ‘gm diet soup,’ which is vastly useful while we get bored with the food. Let us know about this soup and its recipe. Though it sounds as if it has strict herbal ingredients, it doesn’t. You can feel the soup like you are on a regular diet. More than many weight loss meals, “this soup” helps you out in the hungry while saving you from being within the limits of diet pattern. Gm diet has no limit of quantity. You can have as much as you want when you are hungry, but not at irregular times, i.e. in between the sessions. You can add any herbal ingredients in controlled dosage if you wish. Cut the onions and peppers into a pot, fry them mildly in olive oil till they turn brown. Cut the tomatoes, cabbage, celery and add these pieces along with water into the fried onions. Heat the mixture slowly, which may one hour time to boil the vegetables. Add salt and mild pepper for flavoring. Once after you take down the dish from the stove, you can have the soup enjoyably. You can have this soup any number of times, as there are no restrictions regarding the soup. This is an important food of all other mentioned recipes because of the taste it has and healthy nutrients, fibers it provides. This soup requires a special mention over the entire article as one can’t finish the gm diet plan without this soup because of its ingredients of low-calorie intakes, fat burning foods, etc. For brown rice, you have palak paneer in combination but cooked without oil. This is so fat-free and a low-calorie food. By the way, this recipe helps you out if you are a foodie because this is quite a good recipe to relieve hunger; this could take place in the list of a vegan diet plan easily because of its “low-calorie feature” and easily digestible feature. It tastes much good alongside soup and spinach, with the brown rice. Clean the spinach and boil it in water for 3-4 minutes and then keep it in ice cold water for 5 minutes. Now fry the spinach in 1 teaspoon of olive oil, by adding onions, ginger, and garlic. Now grind this mixture of onions and spinach to a fine paste. Now fry the paneer cubes mildly in olive oil till they turn brown. And pour some oil into a pan to fry the spinach mixture, add some masala powder, shah jeera, salt. After some time, add pane cubes and after few minutes take the pan down from the stove, you can now taste delicious palak paneer. Sprouts are the best form of healthy fiber, these are more available in the raw form of lentils and beans. Beans and lentils provide healthy protein and fiber. Here we see the procedure for how to prepare sprout salad. Even though you are not on any diet, it is better to take sprouts every morning as they give rich amounts of fiber contents and remove fats, which mobilizes our metabolic activities even better. So, it is not a special recommendation to include this recipe into the gm diet plan. Sprouts are made from raw beans and lentils. Take the beans/lentils and wash them thoroughly, and soak them in water for overnight. Take them out of water in the morning when you observe they are swollen, keep them in a dry clean cloth tied for around 10 hours. This will make the seed sprouts. Mix these sprouts with tomatoes, onions, green chili. Sprinkle the salt over the mixture and dress it up with coriander leaves and mint. Add a little amount of lemon juice to the mixture and mix the total mixture once again. This will make the sprout recipe which is utmost natural and organic to eat not only during the diet but at every stage of your life. Gm diet pattern involves non-vegetarian also in its seven days duration, but for a vegan diet plan, you cannot simply exclude this sprouts as their merits are discussed. Here you go, the favorite part of non-vegetarians in the weight loss recipe section. Once you complete the half-time of gm diet plan, i.e. first four days of the plan, you are allowed to have a high quantity of food like brown rice, soups. Here non-vegetarians can have some more recipes like this one. Boiled chicken is rich in protein of high quality. One needs not worry how to lose weight in a week with this kind of high energy food. Boiled chicken gives high protein, but not fat. Moreover, the recipe with which it is made will make you even kill your unnecessary weight. Wash the chicken cleanly and place it in a dish or a pot with a lid over it. Pour water into the chicken so that the chicken is completely covered. Add each and every ingredient mentioned in the recipe. Close the pot with the lid and start boiling the chicken. Keep the lid partially so that air escapes from the dish. With small fire, heat the pot up to 90 minutes. Don’t try the chicken so deep, so check the water level frequently, add some more water if needed. Once bones start separating from the meat, you can switch the stove off. Enjoy the boiled chicken with completely organic ingredients, in which you can add vegetable soup for the taste. Fish is also an enriched high protein content and healthy fats like omega 3 fatty acids. Baked fish doesn’t require as many as chicken does. And those who don’t like to take chicken for three days in a row, fish is a very good refreshment. This also requires very quick time for preparation. Mix the onion paste, coriander leaves chopped, black pepper powder, lemon juice. Dip all the fish flakes in this mixture. Apply olive oil readily to the baking tray. Now place these flakes over the tray and keep it in the oven for 20 minutes. Coming to vegetarian diet recipe, this is the coolest of all. This is more useful when you are on a weight loss diet. It’s a foreign food which is not so familiar to many. Here’s the list of ingredients to be noted. Take the olive oil in a pan, heat it, add onions, zucchini, carrots, and squash. Stir them frequently until onions turn to be soft and don’t let them become brown. Add red pepper and yellow pepper, mushrooms and let it be cooked for 3 more minutes. Now add vegetable broth, cardamom, paprika, salt and continue to heat the mixture. Add tomatoes and chickpeas. Reduce the stove now, because tomatoes get fired very easily. Now add couscous while you continuously stir the mixture. Cover the pot with a lid. After a while, serve the recipe dressed up with orange zest and paprika. Here is the presentation of GM Diet Plan in one picture. Just by seeing the picture, you can plan the complete week and follow the diet plan for weight loss. This is the huge representation of gm diet plan with the clear schedule, highlights, scientific explanations, and useful recipes to energize the diet. The above material has the best information of how gm diet chart for weight loss works. If you could find anything newer about how to lose weight fast, please let us know, to become helpful to others through this platform. Here is one more easy way to follow the diet. This video will help you out in preparing the plan within minutes. Watch the video to become more clear on the diet and put it easily into your daily routine. 1. What is the success rate of gm diet plan? A: Gm diet is generally proven to reduce our body weight by 3 to 5 pounds. Losing weight has always been a giant failure trial by many of us. The reason behind this drawback lies in execution, but not in the diet pattern. It is all our ability to be on a diet strictly without deviating onto other foods for our longing towards taste. 2. Can pregnant women and infants’ mothers try gm diet? A: No. Not just the gm diet, pregnant women should not try any weight loss diet for the sake of their and their baby’s health. All they need is a full-fledged nutrition to make a new life out of them. Breastfeeding mothers are also strictly excluded from the practice of gm diet meal plan. A: Diabetic people have huge sugar deposits and no insulin to burn that sugar. Primarily, there is no coordination in the metabolic condition of the body. This concludes that we are not supposed to practice such severe diet plan with this sensitive condition. 4. Can children take the diet? A: People under 18 years of age aren’t allowed to take up the diet whatever may be the situation. Even a child is highly obese, it is not so good to try quick weight loss treatments under age 18. 5. 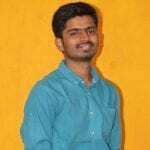 How to avoid non-vegetarian foods in gm diet chart? A: A complete vegan diet plan can be prepared from above paragraphs. Brown rice is the best substitute for all the foods that include meat. Eat as many fruits as you want, but maintain timings and limitations of foods, which to eat and which not to. 6. Does gm diet work in menstrual periods? A: Gm diet has no harm for women during menstruation. But we need to readily take care of the iron content and blood compensation with enough intake of foods. Other than dietary supplements, there is no threat to our body with gm diet pattern of timings and foods. 7. What other fruits and vegetables are allowed? A: Bananas take strange part in this diet, they are completely spared in first three days. But from the fourth day, bananas are key for the day to move on. If at all you do not like banana, g diet would be a nightmare for you. But wait, there are other beautiful options which make out the diet equally effective. Other fruits in the diet include grapefruits, dates, apricots, nectarines. Foods that can be a part of the weight loss meal plan are spinach, ginger, pumpkin, sweet potato, squash, asparagus, carrot, tomato, cucumber, onions, herbs, bitter gourd, bottle gourd, etc. 8. When to have soups and juices? A: There is no rule for them like breakfast, lunch, or dinner as such. At any session, you can have gm diet soup before having meals. 9. What about workouts and aerobics? A: Do not go on difficult physical practices when you are eating fat burning foods. Gm diet is all supportive for fitness workouts, but the first three days roll on least carbs and energy just balancing the needs of the body. Therefore, it is better to avoid intense workouts like boxing, running for a while. Aerobics are good if you are physically alright. But if you are at starting stage of exercises, stick to basic stretching and yoga practices. If you have enough strength in muscles, you can even make a thousand meter run for the first two days, but stop it after the second day at any cost. Do abs exercises for belly fat reduction in the process of diet. No altitude training is good during gm diet. Because there are no excess protein supplements to fulfill the needs. 10. Any cautions regarding drinks? A: Milk is the unique drink which you can have throughout the diet. But if you do not drink milk, yogurt or buttermilk do the job for you. Green tea, any detox tea make an excellent blend of fat burners in a weight loss regime. Alcohol should not be touched in entire 7 days of gm diet. We hope the plans and diet courses work well for you. Good day! !